I’ve finally learned of all the wonders to be found in The Perfect Scoop . I had to get an ice cream maker first, and now that I have one, the three of us (ice cream maker, book, me) will be found together quite a lot. This book can teach you how to make all the classic ice cream, frozen yogurt, sorbet, and granita flavors, and it offers so much more. There are sauces and vessels for dressing up the frozen treats, and the tips and techniques are wonderfully useful. For instance, I didn’t realize I could prevent a mixture from instantly freezing to the sides of the canister by simply turning on the machine, let it start spinning, and then pour in the custard or puree. Then, the serving suggestions had my head spinning. I never would have thought of serving banana sorbet with espresso granita garnished with candied pineapple or chocolate granita crystals spooned over white chocolate ice cream or super lemon ice cream with fluffy marshmallow sauce to mimic a lemon meringue pie. One suggestion I will be trying very soon is butterscotch pecan ice cream scooped onto blondies and drizzled with lean chocolate sauce or possibly caramel sauce. With all of these great ideas, I would have had a very hard time deciding where to start if it weren’t for a great, big watermelon sitting on my kitchen counter. That made the watermelon sorbetto an easy choice. Watermelon was pureed into juice. Some of the juice was warmed in a saucepan with sugar and a pinch of salt until the sugar dissolved. That mixture was combined with the rest of the watermelon juice and some lime juice. Vodka was optional, and I skipped it believe it or not. I quite like vodka with watermelon and lime, but I chose to keep the sorbetto alcohol-free. The watermelon juice mixture was chilled, and then it went into the ice cream maker after turning it on and letting it start spinning of course. There was one special ingredient in this sorbetto. 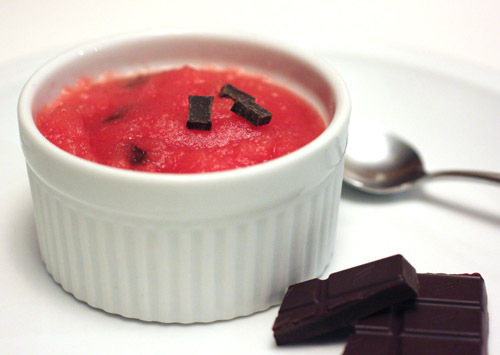 Rather than just freezing that watermelon juice mixture, a surprise in the form of mini chocolate chunks was stirred in at the end. The little chocolate pieces look like seeds, and they give the sorbetto bits of crunch and dark chocolate flavor. In the book, the sorbetto is shown frozen into popsicles. I don’t have a popsicle mold, yet, so I froze mine as individual servings in ramekins instead. Individual servings are almost as fun as a popsicles aren’t they? It often seems like frozen treats are just for summer, but there are ideas for all seasons throughout the book. I’m looking forward to creating all of these frozen treats for all kinds of occasions to come. Just like Ray Charles said...You got the right one baby! Man, isn't the perfect scoop the most amazing resource EVER? LOVE that book. Gorgeous gorgeous sorbetto. I'd hang on to summer a bit for a bite of this! I LOVE how the chocolate bits look like actual watermelon seeds. This is way too cute! This is really quite pretty! I think you and your ice cream maker are going to have a very long wonderful relationship. I think those bits of chocolate really gave the sorbetto an over the top look. Have never tried a recipe with watermelon, I just love to eat them in big slices. But this one looks so fantastic! I love the combo of chocolate pieces and watermelon, they look glamorous! So refreshing and so pleasing to the eyes as well. I just ordered that book. I just bought an ice-cream maker and wants great recipes. Love the color of your sorbetto. So refreshing. The combination looks so unique and interesting to me! We are also planning to get one ice-cream maker. May I know which brand you are using now? Belle and I made this exact recipe last week. it is yum. I have been wanting to get that book, the ideas sound fantastic. This sorbetto is a beauty. I was surprised how good watermelon and chocolate was one time I put them together. I love the way the chocolate mimics the seeds in watermelon. I bet it is so refreshing. We are just coming up to our really hot time of year so I may have to try this soon. Such a beautiful color! A great sorbetto! This looks so refreshing and cooling. Beautiful sorbet. 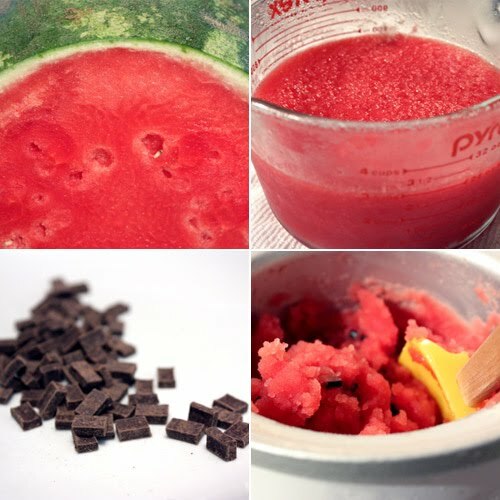 I've never thought about putting chocolate with watermelon. It looks really pretty! 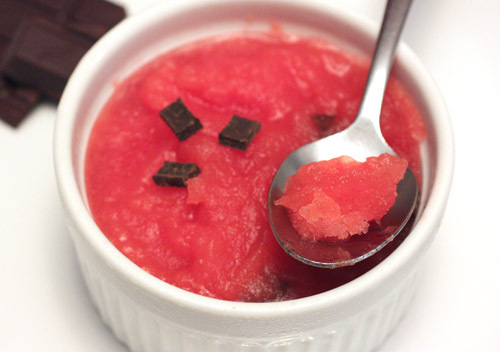 Watermelon with chocolate!! Now, that is an apart taste!!! wow..interesting combo. The colour is so pretty! Of all the frozen things i made this summer, I missed out on the watermelon. The chocolate idea is great. My kids would so love this!! Refreshing! But summer will be over soon here. I agree with the other comments. The color is so pretty! Seems like a good dessert for a bbq! That really looks refreshing! I procrastinated all summer and never got my ice cream maker! I wish I had now! i wondered if that was chocolate! interesting touch, i can safely say i've never had watermelon and chocolate in combination. classy dish, indeed. I just posted an entire comment (or so I thought) but then forget to enter the verification code... Anyway, I love your watermelon sorbetto and definitely feel I need to go and buy David's book too! mmmmm look so refreshing. plus i just want to pick off those little chunks of chocolate. haha. yum. Watermelon and chocolate, such an interesting combination...I'd really to try it :-) The color of the sorbetto is so pretty...nice pictures! What a genius idea to add the chocolate chunks, I can just imagine how wonderful this flavor & texture combination is, excellent! Wow that looks awesome. I love the little bits of chocolate! They're like little watermelon seeds but more delicious.